"In Mother Words" Tickets Giveaway!!! You and a friend can join me at Geffen Playhouse on Sat. Feb. 19th @ 3pm for their very special event "Mom's Day Out"! As moms we work VERY hard, and it's rare that we get an opportunity to take some time out and enjoy the company of other moms in a fun environment, so we're hoping you and a guest will join me for a special afternoon of entertainment featuring the new show, "In Mother Words." This show, written by some of contemporary theater's most talented voices, tackles the subject of motherhood in an eye-opening, hilarious and irresistible night of theater and makes its West Coast debut with award-winning actors Jane Kaczmarek, Saidah Arrika Ekulona and James Lecesne. As the program states, "Whether you are a parent, have a parent or ever want to become a parent, this play will elate and terrify equally - much like motherhood itself." There will also be a food and drink reception following the show from 4:30pm to 7:30pm.I know I could use a drink. Mandatory Entry: What TV mom do you admire? 1) Earn one additional entry by following my blog publicly via Google Friend Connect. If you are already a follower leave it in a separate comment and it will count. 3) Earn one additional entry for tweeting this contest (leave a link to your tweet as your comment). Please follow all the rules or your entry will not count. This contest is open until Tues, Feb. 15th at midnight. I must have a valid way to reach you, so leave me your email address in your comment OR be sure your profile has your email address visible. No duplicate comments will count. This giveaway is open to US residents age 18 and older. Winners will be selected via random.org and must respond within 48 hours of being notified by me or I will select a new winner. Tiny Tot Tuesday at the El Capitan with "The Little Mermaid"
If you have a toddler and avoid the theaters because it's too dark and loud and your kid is too busy trying to cruise the aisles and asking questions during the movie then I have a solution for you!!! 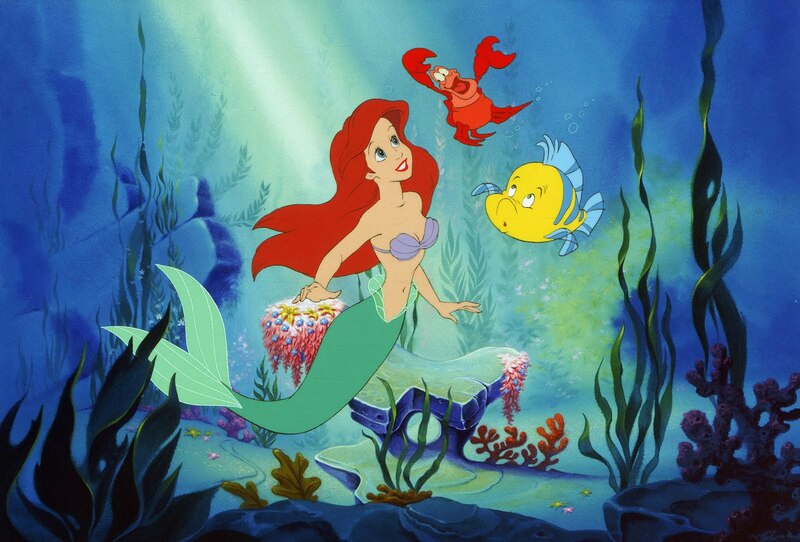 Tiny Tot Tuesday at the El Capitan presents the Disney classic "The Little Mermaid" on January 25th! For this special screening the lights are slightly dimmed, the sound level reduced and the kids are encouraged to dance in the aisles if they get the urge. Parking is conveniently available across the street at Hollywood and Highland with validation. AND they are offering a "Mommy" code discount to all my readers at $9.00 per ticket. Don't miss this Disney classic at the historic El Capitan Theater! You'll be glad you did. Young, Blonde and Beautiful AIN'T Got Nothin' on ME!!! The past two days I've gone for a hike @ 6:45AM. I know, crazy but it's the only time I can get it in. Each day I've seen the sun come up and I relax and enjoy the beautiful sunrise while still holding my keys in the "in case an attacker comes out" position in between my fingers. BTW, both days Richard Grieco (AKA Johnny Depp's replacement on "21 Jump Street") has said good morning to me. Hot Girl 2: OMG, totally!!! Hot Girl 1: You know what sounds good? As they bounced away from me I couldn't hear the answer but just heard giggling as I slowly strolled away. I remember those days of just being care-free and flying by the seat of my pants. You wanna go hike? SURE!!!! Maybe get mani/pedi's after? Why not?!!! Never having to worry about nap schedules, laundry, dirty dishes in the sink because I was single and only had to worry about me, myself and I. BUT with all those responsibilities comes GREAT joy. Every time my daughter says, "I love you mommy" and wraps her arms around my neck all the work becomes worth it. When she asks to see "Beauty and the Beast" for the 187th time and chimes in during the "Be Our Guest" song when the candlestick says, "Don't believe me..." she yells with anticipation and excitement, "ASK THE DISHES!" then looks to see if I'm as excited as she is. I say to myself, who needs to have an open schedule for spontaneous hikes and mani/pedi's...not me. I love where I am today as opposed to where I was in my early 20's. My life is richer and fuller. Sure there are some days where it's tough and I have to dig deep and say "just get through it". Good thing I have an extra large shovel. Thanks for letting me share my random thought of the day.